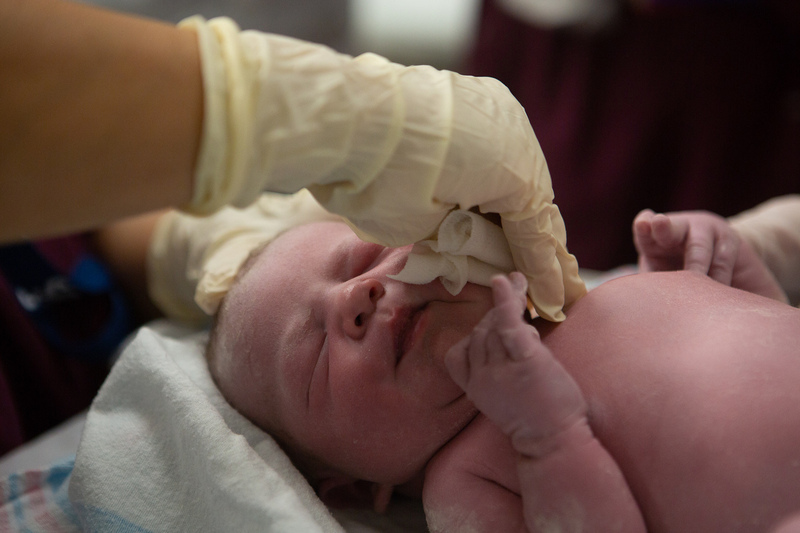 After C-Section, Does Spreading Mother's Microbes On Baby Improve Health? 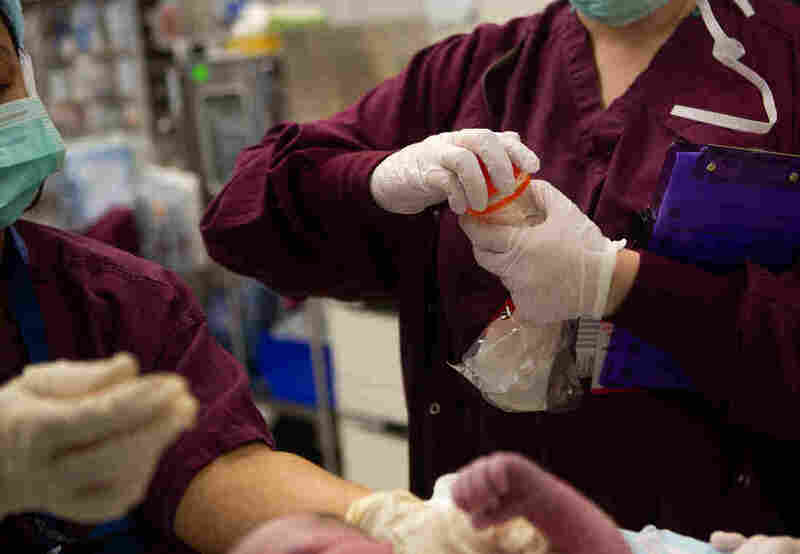 : Shots - Health News After a C-section, does swabbing a baby with the mother's microbes reduce the risk of obesity and other health problems later in life? An ambitious study to help answer the question is underway. Evelyn Marie Vukadinovich is swabbed with a gauze pad immediately after being born by cesarean section at Inova Women's Hospital in Falls Church, Va.
Danielle Vukadinovich is sitting up in a hospital bed at the Inova Women's Hospital in Falls Church, Va., waiting to give birth. "I feel good, I'm excited!" says Vukadinovich, 35, of Annandale, Va., "Nervous, but good!" Vukadinovich is getting a cesarean section today. It's the second time for her — she underwent the surgical procedure 19 months ago when her twins were born. This time Danielle wants to try something different, something that might sound strange. As soon as her daughter is born, a doctor will wipe fluid from Danielle's birth canal or a sterile solution that serves as a placebo all over her baby's body. "I haven't told many people about this yet," Vukadinovich says, laughing. "I understand why people would be like, 'Oh my gosh. That's so weird.' But I don't think it's yucky. It's normal. It's natural really." The procedure, known as "vaginal seeding," is designed to help babies develop healthy microbiomes — the collection of friendly bacteria that inhabit every person's body. Some people call it a "bacterial baptism." "It's a little bit like that baby's first dunk," says Shira Levy, the microbiome research manager at the Inova hospital. "That's their first religious experience. You know, they get the water and that changes their spirituality. "In this case, they get the bacteria and that changes their microbiome," Levy says. "This is their first microbiome experience." The procedure was developed in response to the sharp rise in C-section births in recent years. That increase has been accompanied by more cases of asthma, allergies, eczema, obesity, and other diseases. The theory is that the rise in these diseases might be happening, in part, because babies aren't getting exposed to their mother's microbes the way they would if they were passing naturally through the birth canal. "We think that one of the reasons that babies born by C-section are at increased risk for these diseases is because they don't receive that first beneficial exposure to their mother's vaginal microbiome," says Suchitra Hourigan, a pediatric gastroenterologist at Inova. One very small study indicated that swabbing C-section babies with their mother's microbes immediately after birth could make their microbiomes develop more like those of babies born vaginally. But the appeal of vaginal seeding has outpaced evidence that it is safe and effective. Some couples have started trying vaginal seeding on their own. Vukadinovich jokes that she considered doing it herself. After all, she says, she's a nurse and her husband is a high school biology teacher. 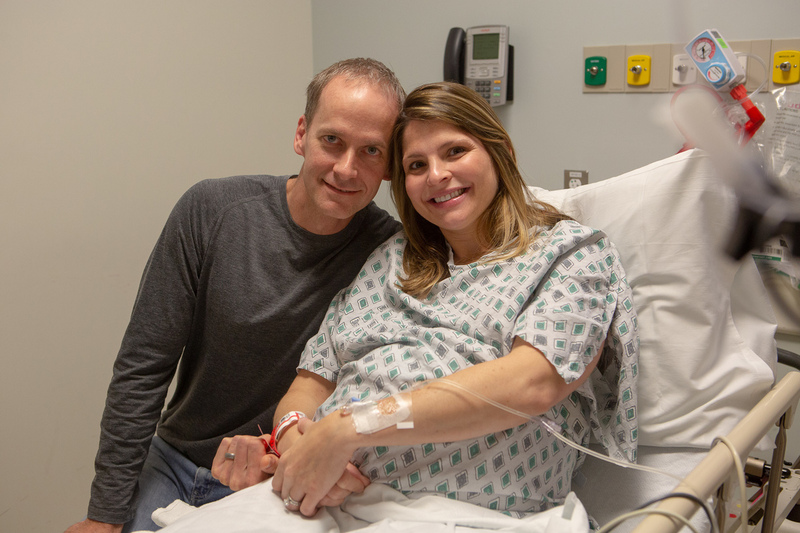 Danielle and Nick Vukadinovich of Annandale, Va., volunteered to have their newborn daughter be part of a study to assess the use of bacterial smears after C-sections. "I even told my mom: 'Nobody has to know. My husband would help me out,' " she says, laughing. "But I try not to take unnecessary risks." Vukadinovich knows the procedure could be risky. Babies could be inadvertently exposed to disease-causing microbes, such as herpes virus or streptococcus bacteria. In fact, medical groups such as the American College of Obstetrics and Gynecology warn women against doing this. "While there are data to suggest that there may be some scientific plausibility to the concept, it is not without significant risks," says Neil Silverman, a clinical professor of obstetrics and gynecology at the UCLA School of Medicine, who represents ACOG. The group notes that mothers also transfer microbes to their newborns through skin-to-skin contact and breastfeeding. So Vukadinovich was thrilled when she found out she could be part of the first study the Food and Drug Administration is allowing to rigorously test whether the procedure is safe and helps improve babies' health. "Who knows what's going to happen with the results? But if it does show something positive, I just think that would be great for kids and parents," she says. Hourigan, who's helping lead the study, agrees. "Just to be able to reduce one risk factor for obesity, especially when there are such high [C-section rates] in the U.S., would be huge," she says. 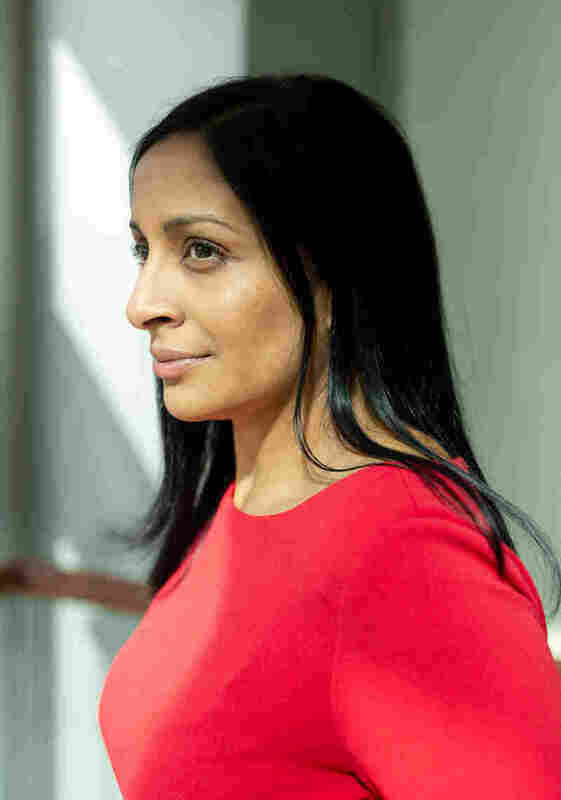 "We think that one of the reasons that babies born by C-section are at increased risk for these diseases is because they don't receive that first beneficial exposure to their mother's vaginal microbiome," says Dr. Suchitra Hourigan at Inova Women's Hospital. In the study, half of the babies will get swabbed with their mother's microbes; half will get swabbed with a sterile solution. All of the mothers will be carefully screened for dangerous infections. All of the babies will then be followed for three years to see if they become obese or develop other health problems. A similar study is starting at the Icahn School of Medicine at Mount Sinai in New York City. Vukadinovich agreed to let an NPR reporter and photographer observe her baby's birth and the swabbing. It's the first time journalists have been allowed to watch a baby go through the study. As the nurses wheel Vukadinovich into the operating room, Hourigan, Levy and Dr. Varsha Deopujari follow. Deopujari, the study's clinical manager, will do the actual swabbing. Inside the OR, everyone quickly takes their places. As the surgeon starts, Hourigan explains what's happening. It goes very fast. "An incision is being made into mom, and they are getting ready to take out the baby," Hourigan says. "They can see the head. And the head is now coming out of the C-section incision. Baby's head is out." In less than a minute after the surgery starts, the baby girl is completely out. A nurse rushes the newborn to a nearby table to clear her breathing. After the baby is breathing smoothly, Deopujari starts swabbing with a gauze pad. First, she swabs the baby's mouth, cheeks and face. After turning the gauze over to expose more bacteria, Deopujari wipes the baby's hands and arms. Next, she wipes down her chest, goes over her abdomen, up the other arm and then over her back. A gauze pad that will be used in a study of vaginal seeding is taken from a storage container. "And the swabbing is now over," Hourigan says. Deopujari hands the baby back to a nurse. Hourigan and her team quickly head out of the OR. "That went perfectly," she says. "Baby came out and was crying. We waited until baby was stable, and the swabbing went just as planned." Hourigan and her colleagues will swab 50 babies to make sure their procedure is safe. If it is, they plan to expand the study to 800 babies, who would randomly receive either the bacterial swab or a placebo, throughout the Inova hospital system. The results could prove important. "We need more data and we need better data," says Silverman, of ACOG. "If it shows that there is a clear benefit, then this process can be re-evaluated." The next morning, Vukadinovich, her husband, Nick, 41, and their new daughter are together in a hospital room. "I'm good — feeling good today," she says, cradling her baby. The couple doesn't know if their new daughter, who they would later name Evelyn Marie, was exposed to her mother's microbes or a sterile placebo solution. But they have their fingers crossed she was swabbed with bacteria. "I really hope that she was," Vukadinovich says. "If there's a decreased chance of her having any health issues, that would be awesome." "We're not terribly religious so we won't baptize with water — holy water," Nick says. "But since we're scientists, we like the idea of a bacterial baptism instead of a holy baptism — because now she's been initiated with bacteria, friendly bacteria, that should protect her down the road."